The shimmering golden aspens of the Rocky Mountains are known for their white trunks and brilliant fall color, but did you know their biological secret? Clumps of aspen trees are actually clones of each other. Yes! They share the same DNA. Stands of golden aspen trees flourish in Grand Teton National Park. September, 2018. Now you know! Subscribe to this blog to learn more fun facts about Nature and amazing travel destinations. You will receive an email when a new post is published. I can hear these words echo in my mind, “The Moon carries tremendous visual weight.” My photography mentors remind me to consider this when I compose a frame with the moon. I am listening. The viewer’s eye is immediately drawn to the moon. To create balance in the composition, the other side of the frame needs some “weight.” That’s where the Grand Teton comes in, the high peak on the right. While the lodgepole pine directs they eye to the full moon, the Grand Teton range cuts a jagged line in the morning sky. This image also features a contrast of cool and warm tones. The blue and grey in the sky and mountaintops contrast the warmly lit fall color in the trees and grasses in the valley. Good morning, Jackson Hole! I’m enjoying a deep breath of your fresh air and cool Fall temperatures. It’s time for a warm cup of coffee. Many nature photographers prefer to shoot on cloudy days, when the dynamic range is not too wide for the camera to capture, and sharp shadows don’t create issues. In other words, the experienced photographer can be assured of capturing detail in both the highlights and the shadows. But sunlight very early and very late in the day creates other nice opportunities. 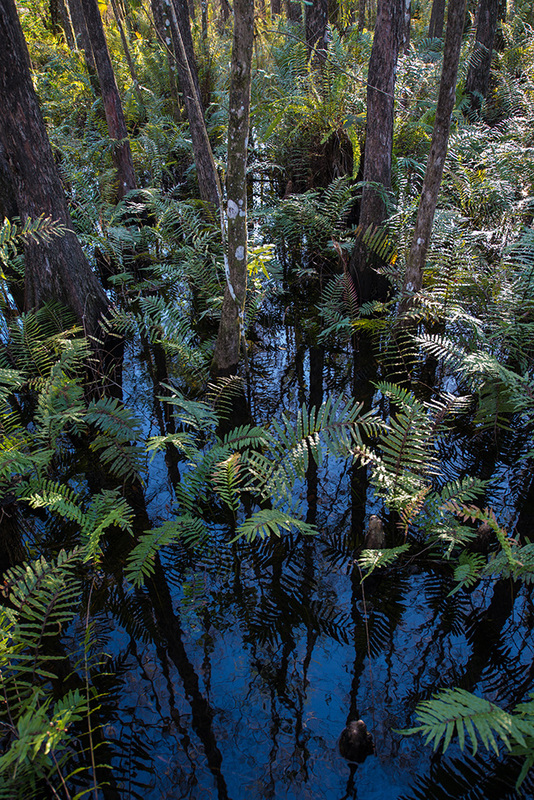 For example, in this photograph in Six Mile Cypress Swamp in Fort Myers, Forida, the shadows made good leading lines, as did the sunlight coming in from the upper right corner. All those lines converge in the low center of the frame. The blue sky made a vivid reflection in the still water, and the yellow sunlight in the background adds some warmth. This time of year when we experience fewer bright sunny days, we appreciate what sunshine can do for our mood. I certainly feel more energetic and upbeat on a sunny day. How about you?